Opened in 1989, the San Pedro Underwater Archaeological Preserve State Park is the second Underwater Preserve in Florida. As a Florida State Park, it's also somewhat unique in that access is via boat only. This is because the area is located just over a mile offshore, south of Indian Key. The Park Headquarters are at U.S. 1 Mile Marker 85.5, Islamorada Florida 33036, and the phone number is 305-664-2540. Open every day of the year, there's also no admission fee. 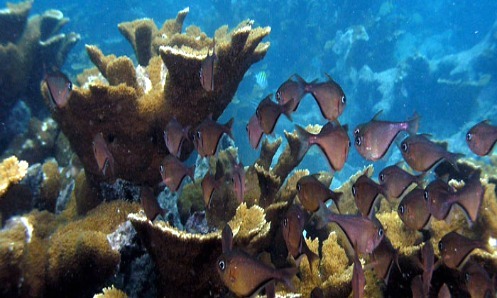 Due to it's history, and proximity to land, the area has become one of the best snorkeling in Florida Keys sites that's equally popular with divers. Glass bottom boat tours also visit the area, making it possible for those who choose not to enter the water to view the beauty below. Gracing the center of the Preserve is the San Pedro herself. She was a 287 ton Dutch built merchant vessel that was part of the 1733 Spanish Treasure Fleet. Commanded by Captain Gaspar Lopez Gonzalez, she was traveling from Havana, Cuba to Spain with the rest of the Flota. When the Florida hurricane winds escalated, she was pushed westward toward the islands of the Florida Keys. Forced onto a coral reef, she was repeatedly hammered by the wind and waves, where she took on a considerable amount of water. Finally a strong wave forced her over the reef and into Hawk Channel. Here she grounded, submerged to her decks suffering severe damage. With everyone aboard still alive, the crew were able to assemble make-shift life rafts from her timber. Once they were safely on land, they set up a temporary command center. From here they commuted the mile back and forth to the ship, to salvage what cargo they could. This wreck has also become one of the more popular Florida Keys diving sites associated with the Silver Plate Fleet. The reason is her cargo, which included cochineal, indigo, Mexican ceramics, bullion, 16,000 pesos in silver coin, tanned hides, and cases of Chinese porcelain. Over the years, wreck diving this site has yielded up numerous Spanish coins dating from 1731 - 1733. Not only has this been a "productive" site, it's also a beautiful Key Largo diving site to visit. Tropical fish dart around her ribs and keel which lie buried in the white sand at about 18 feet depth. 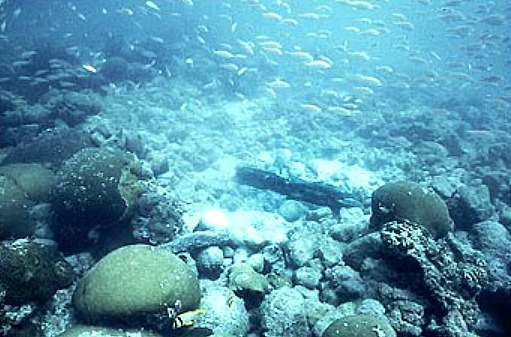 Her remains are surrounded by sea grass, brilliant coral, along with bits and pieces of timber. The ballast stones from the San Pedro make up a fairly large pile that is about 90 feet long and 30 feet wide. Mixed in with the ballast you'll also be able to spot some of the red ladrillo bricks that once made up the base of her galley stove. Placed at the north end of her ballast pile is a 1733 anchor. 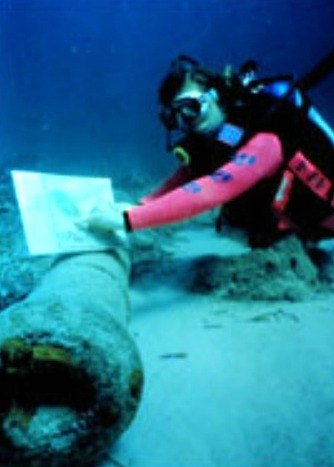 7 cannon are also situated around the wreck, 3 of which are buried under the sand. These cannon are replicas that were placed at the San Pedro when the area became a Preserve. There's also a plaque at the south end of her ballast pile, which identifies this site as a State Underwater Archaeological Preserve. Of course any time there's a Spanish shipwreck, there's the possibility of more wealth to be discovered. Before the area was protected, salvagers were able to take whatever Spanish treasure they found. This scuba diving site still shows the damage done by their numerous salvage efforts made over the years. To this day, it's widely believed that more Spanish treasure could still be found. Possibly some of Spain's lost wealth lies buried beneath the San Pedro's bones, or tucked up under some of the surrounding sea grass. However, the area where the wreck is located is not just protected, it's been heavily picked over. For treasure hunters, the good news is that there's a strong possibility that over the centuries, the current has washed some of the coins further from the wreck. This means anyone searching outside of the 1.000 yard radius of the San Pedro Underwater Archaeological Preserve can keep any Spanish treasure they should happen to find. Another piece of good news relates to the quantity of gold and silver recovered. After the severe Florida hurricane, the Spaniards spent a number of consecutive years salvaging the ships they'd lost. The end result was more wealth found than what was listed on the manifest. This discrepancy is due to the fact that contraband was on board. It also means that considerably more wealth may be unrecovered than previously imagined. One note of caution however. 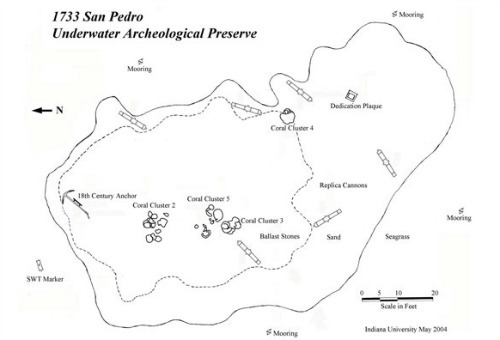 After diving the San Pedro Underwater Archaeological Preserve, you'll see the damage that can be done by salvagers to an area. This means you'll want to exercise care in your treasure hunting endeavors, when working outside the Preserve area. On May 31, 2001, this scuba diving site was added to the U.S. National Register of Historic Places. Not only is it of historical interest, it's a visually stunning Key Largo diving site. The shipwreck is positioned against a backdrop of white sand, and surrounded by rich textures of colorful marine life. Close to shore, in clear, shallow water, you'll appreciate why the San Pedro Archaeological Underwater Preserve is such a popular scuba diving Florida Keys and snorkeling site.